Another task within my Master’s research is checked off. I have reviewed and noted the conversations and behaviors from video footage of 25 family groups using our Ideum multi-touch table exhibit. As I went through the footage, it was fascinating to see the similarities and differences in how groups used the exhibit, talked (or not) while using the table, and the elements of the exhibit that appeared most attractive to them. I will be analyzing the engagement and learning strategies data along with the group interview responses that I collected post-use of the exhibit. I am so thankful for the infrastructure that we have installed as part of the Cyber Lab. The video recordings that include audio of the group conversation has been a great way to examine the data beyond field notes from the date of observation. Quite a bit of data to make sense of! This quarter I have had the opportunity to take the Socio-Cultural Dimensions of Learning course from Dr. Lynn Dierking at Oregon State University. It has aligned perfectly with where I am at in my project. Topics in the course have included how we learn through our interactions and observations of others, how culture influences learning, and how institutions scaling from families, to museums, up through society plays a role in the learning experience. Family learning in museum spaces has been one topic that we have focused on, particularly how different members of a multi-generational group make meaning of exhibits and content that is personal and relevant to their experience. An element that I have taken an interest in is the roles that the family members take, whether it is the adult or child, and who “takes charge” of the interaction with the exhibit. For example, is it primarily the adult showing the child how to use it, or explaining what the information means? In what ways do they make connections to what the child already knows? These questions relate to my observations with the touch table. I have seen evidence of the child taking charge of the interaction and showing the adult, and I’m curious to investigate what strategies the child uses to “show” the adult what to do. I wonder if it is because this generation is often around touch surfaces with their personal electronics, that they feel comfortable taking on that role to “teach” the adult. I have also appreciated the opportunity to interact with other students in the socio-cultural dimensions class that are located around the country, many who also work in free choice learning venues. Several students have shared teaching and learning strategies that they use to interact and engage with their visitors. The course has inspired me to think more about the transition from theory to practice, by applying what we are studying to improving the learner experience. We can conduct this research, but until it is applied and shared, it seems anticlimactic (at least to me!). I hope from my research of watching the natural behaviors of families using the multi-touch table, I can provide recommendations for ways to improve content to facilitate the behaviors they are already expressing. The technology is a tool that is being used to share science content, so what meaning are the users making of that information? Research has been done on the overall usability of large scale touch surfaces in public spaces, but how does that connect to learning in a space where individuals have choice and control over their experience with the technology? It is not so much as HOW they use it, but what do they gain as a result of the interaction on a personal or social level? The beauty of research – you look to answer some questions and come up with more! Posted in Analysis, Exhibits, Research. I have been absent from blog posting as of late due to the whirlwind of grad school, but that also means there is quite a bit to share related to work in the lab and research! My last post described the experience at ASTC in North Carolina – a great opportunity to see work at other science and technology centers, and to meet professionals in the field that are doing incredible things at these locations. Since then I have been ramping up on my personal research, but also balancing coursework. 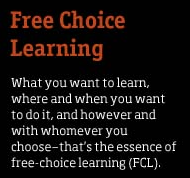 I am really excited to be enrolled in Oregon State University’s Free Choice Learning (FCL) series this year. Everything I was learning “in the field” is now gaining context through courses in personal, sociocultural, and physical dimensions of learning. I have the opportunity to practice evaluation methods through assignments and read papers related to my research on family group interactions in the museum. I am thankful that I get to take these classes from Dr. John Falk and Dr. Lynn Dierking, two researchers that have studied FCL for many years! In the visitor center, we are focused on getting our facial recognition cameras consistently working and capturing data. We have been collecting images, but getting 11 cameras to stream a lot of data at the same time is challenging as both the hardware and software have to sync. This has been a great learning opportunity in trial and error, but also learning the “language” of a field I am not familiar with. As I have to troubleshoot with engineers and software developers, I have been learning vocabulary related not only to the camera system, but also the usability of configuring the cameras and the software. Beyond the task of setting this up, it is an experience that I will reflect on with future projects that require me to learn the language of another industry, embrace trial and error, and patience in the process. 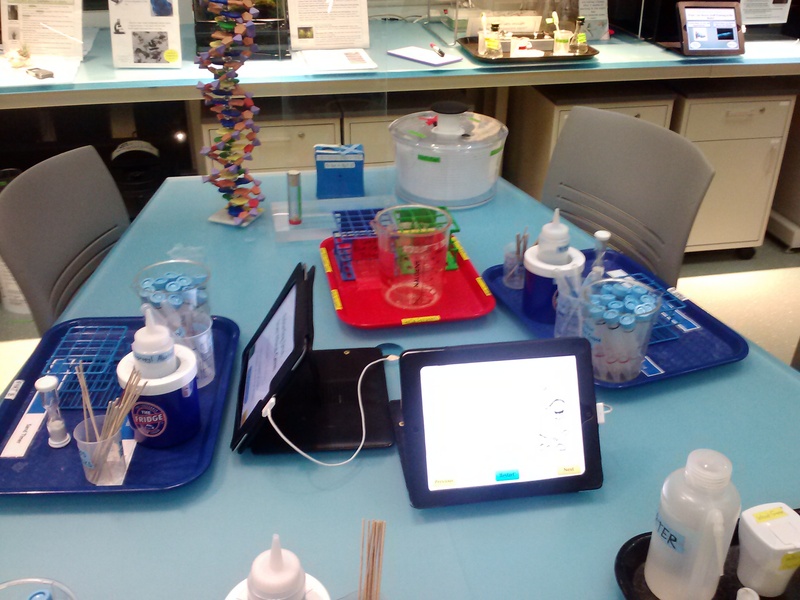 In addition to Cyberlab duties, I am busy coding video of families using the multi-touch table collected in August 2014. Over the past twenty years, research on family learning has shown us how exhibits are often used (much of this research was done by Falk, Dierking, Borun, Ellenbogen, among others). I am curious about the quality of interactions occurring at the touch table between adults and children. I developed a rubric based on three different dimensions of behaviors – responsive engagement, learning strategies and opportunities, and directive engagement, and whether they are observed at low, moderate, or high levels. These categories are modified from the types of behavior outlined by Piscitelli and Weier (2002) in relation to adult-child interactions surrounding art. From their work, they found that a distribution of behaviors from these categories support the value of the interactions (Piscitelli & Weier, 2002). Each category looks at how the adult(s) and child(ren) interact with each other while manipulating the touch table. I also modeled the rubric after what is used in the classroom to assess teacher and student interactions around tasks. 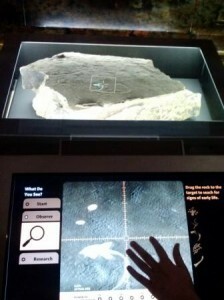 An example of a high level of responsive engagement would be that the adults and children are in close proximity to each other while using the exhibit, their hands are on the touch surface for a majority of the time, the adults are using encouraging words and acknowledging the child’s statements or questions, and there similar levels of emotional affect expressed between them. 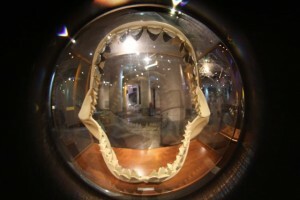 Learning strategies focuses more on the verbalization of the content of the exhibit and the integration of information, such as connecting the content to prior knowledge or experiences external to exhibit use. Finally, directive engagement looks at whether the adult is providing guidance or facilitating use of exhibit by directing a task to be performed, showing a child how to accomplish the activity. From this data, I hope to understand more at depth how the table is used and the ways adults and children interact while using it. This may give us some idea as to how to support software and content design for these forms of digital interactives, which are becoming more popular in the museum environment. My goal is to have videos coded by the end of the month, so back to work I go! Piscitelli, B., & Weier, K. (2002). Learning With, Through, and About Art: The Role of Social Interactions. In S. G. Paris (Ed. ), Perspectives on Object-Centered Learning in Museums (pp. 121–151). Mahwah: Lawrence Erlbaum Associates. Posted in Analysis, Exhibits, Methodologies, Qualitative Data, Research, Visitors. Posted in Conferences, Free-Choice Learning. I started “18th” grade this past week, also known as the second year of my two year program at OSU. The beginning of a new academic year is a great time to reflect and I’ve been thinking about my evolution as a graduate student and on the work we have accomplished in the Cyberlab thus far. Since my first posts from last year, much of what I wrote about being patient in the process still rings true. Iteration and refinement help to direct the course. As I have made progress in my own research study, I still have to be patient as the project unfolds as some unique results may appear that I might otherwise miss. Looking forward to where I might be next September is exciting too. It is unknown at this time, but thinking about all of the potential opportunities…who knows! I am proud to say that I have transitioned into the analysis phase of my Master’s research. I have some results from my interviews of the families that used the touch table, but more will be following as I start to review the videos. One challenge has been to develop a strategy for analyzing the video of families using the table. This is something I have not done before. There are some resources for analyzing video in non-school settings, so I am referencing that heavily. One book that has been particularly helpful is Video Research in the Learning Sciences (Goldman, Pea, Barron, and Derry, 2007). This is the most comprehensive source with theoretical and methodological guidance I have seen, especially with connections to filming observations in an informal science setting. As family behavior and interactions in a museum setting has been studied (Falk, Dierking, Ash, to name a few), we have a better idea of the types of behaviors that take place in this environment. I am interested in the degree to which they are occurring around the touch table. We know parents may read content on signage aloud, point, question, recall past events…but to what extent is this happening with technology that is not commonly seen (at least scaled to a table on a daily basis)? I’m going to approach this on a spectrum or scale of low to high levels of the presence of behaviors. Using a rubric as a way to score the interactions, something done to assess teacher facilitation in the classroom, I believe this is a way to put a “measure” on the adult and child interactions. From the results, we may have a better idea of what the quality of interaction with touch tables looks like in a science center, allowing us to point to specific areas to improve content that affords these behaviors on a deeper level. This quarter I also started taking the free-choice learning series through the College of Education. It is perfect timing as I work through my research project. I am gaining knowledge and a better understanding of what learning is and the context to which it takes place, and how we do not learn in isolation. Our perspectives and experiences can be shaped by those around us, one reason for my interest in family learning behaviors. The first course is “Personal Dimensions of Learning” and I appreciate the new resources to read about motivations and identity as related to self-driven learning. As this is an Ecampus course, there are students from around the country doing incredible science education projects both in and outside of a formal classroom setting. I am looking forward to getting to know them better as the quarter progresses. Next post will recount my first experience at the annual meeting of the Association of Science and Technology Centers (ASTC). I will be tweeting from Raleigh next week – follow me @East_JennyL. After all the preparation for my research study, it was finally time to sit and observe visitor behavior around exhibits and collect some data. This allowed me to personally see what natural behaviors in an informal science setting look like, while applying the skills and knowledge I have gained about conducting research and interviewing human participants. Over the course of August I interviewed 25 family groups after they used the Ideum multi-touch table. My goal was to collect data in the Visitor Center over morning and afternoon hours each day of the week to get a wide distribution of visitor attendance. After each sampling session I was busy processing the data, inputting survey responses and typing up the comments from the open-ended piece of the interview, while downloading video footage of the interactions. I enjoyed the result of our team’s effort of putting the camera system in place, as it was convenient to go back to the day of the visitor encounter and know that their conversations and interactions were captured unobtrusively on film. The set-up of the Cyberlab provides an advantage to past methodologies where the researcher physically tracked the visitor or a large video camera was placed right over an exhibit. Through our methods, I believe we are collecting very natural behaviors by the visitor which will help us understand learning in the public science setting more efficiently and effectively. Family use of museums and science centers have been investigated over the past few decades, but as learning researcher Doris Ash noted in 2003 in the Journal of Research in Science Teaching, there are few studies that investigate at depth the dialogic analysis of interactions with the family group. This is important to understanding how meaning and sense-making between learners takes place in the informal science setting. In looking at the research on large touch surface technology, I have not found much on family group use in public settings with science-related content. The field of human-computer interaction has explored this technology with regard to usability features, particularly with gestures and software or program navigation. I hope that my research provides insight combining both family learning and how this technology can support that. While there are many different layers to the informal science experience (physical, personal, and sociocultural elements), I thought about the individual and collective learning in the family group, as well as how they were positioned in the physical sense around the touch table during the “live” observations. As I look at footage, I will be exploring the interactions and roles that occur within the group while considering the conversations that are taking place. I am also interested in the overall response to the touch table. Part of my interview with the group was to hear how they would describe their attraction to the exhibit and how they described their interaction with this type of technology. I will be doing some content analysis in an effort to see what the common themes are within their responses. Considering the other technology we have, a familiar digital “interactive” is a single user kiosk or desktop computer with games and information. The touch table allows for multiple users and inputs and is not commonly seen in other settings. We have a desktop interactive located near the touch table, and I observed families (in groups of two, three, even up to five) crowding around the computer and “coaching” the user in control of the mouse. As the desktop exhibit affords one kind of experience, the touch table allows for collective physical action at the same time. Five people could use this exhibit at once. Keeping this in mind, how can we (informal science centers with access to the technology) take advantage of this to facilitate learning for the individual and the group? September and October will be busy months analyzing footage. I am eager to see just what comes out of all of this data!